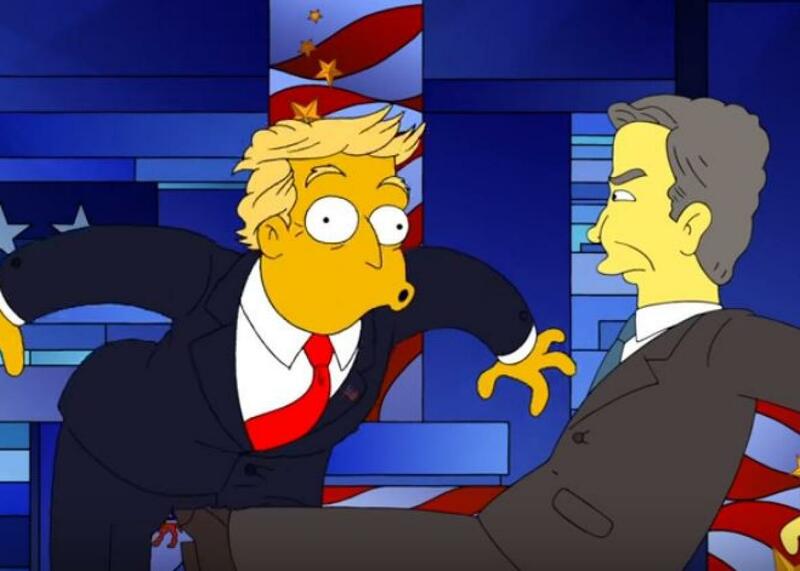 Watch the Simpsons mock the presidential campaign. “Wanna see something my mother suggested?” Jeb Bush asks before kicking Donald Trump in this screengrab from a Simpsons video posted online on Feb. 20, 2016. Homer then calls on Marge to “visualize another America, one where Democrats, Republicans, and Donald Trump all get along.” The candidates then proceed to break out in song. But it doesn’t last long. “I was perfect, the rest of you morons were flat,” Trump says. All the candidates start rumbling and Jeb Bush even kicks Trump in the nuts. “Hillary, if I get elected will you tell me what to do?” Bernie Sanders says as Clinton chokes him with her necklace. In the end though, Marge doesn’t seem all that upset by the fighting and just wants to find out what happens next.